As I rule I try not to get too excited about restaurants before they open, especially if their USP appears to be looking more like a day spa than a place to eat. 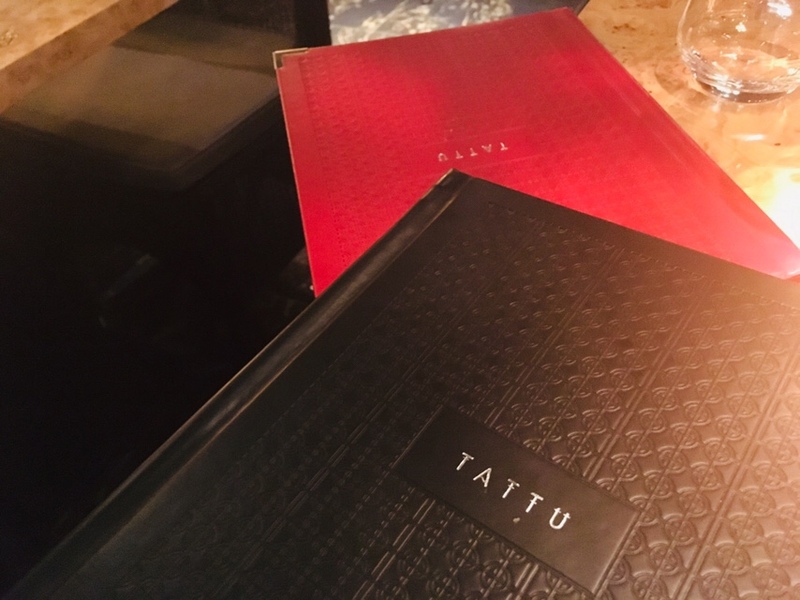 The hype behind Tattu opening seemed to be largely based on it being more of a sensory experience rather than what you can actually eat. 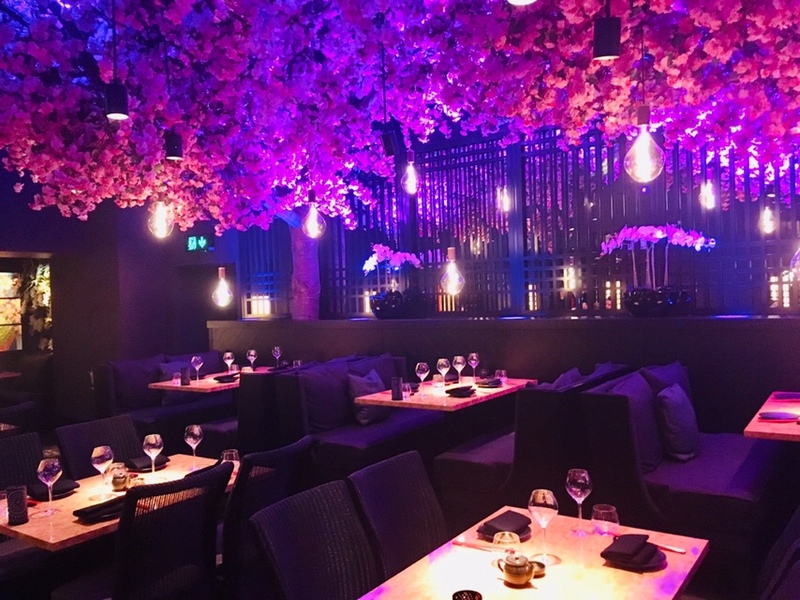 I like plush soft furnishings and some statement foliage as much as the next person, but there needs to be more to a restaurant than the fancy pants decor and mood lighting. 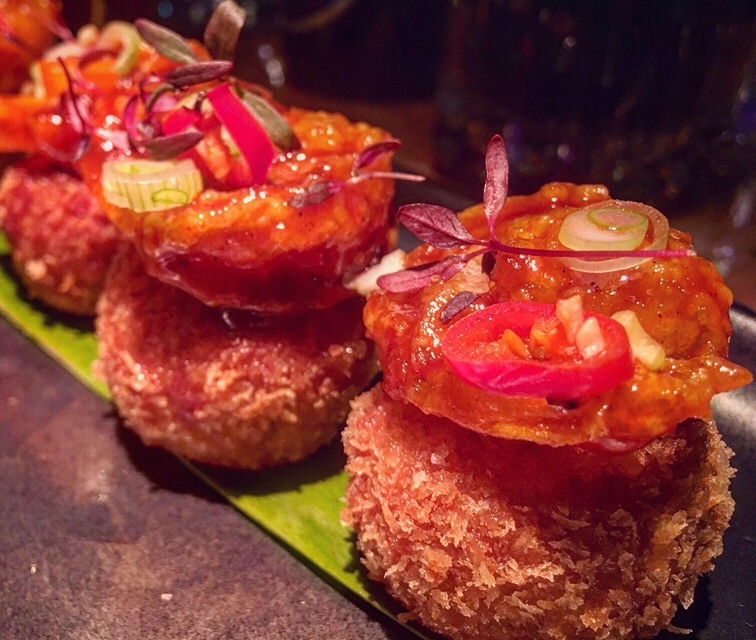 So does Tattu’s approach to food rival its commitment to looking ‘Instagram worthy’ across four rooms, or is it style over substance? The menu boasts some tasty sounding mains, but on my maiden visit my friend Alison (single and ready to mingle, lads) and I stuck to a buffet of dim sum and small plates. When it comes to Chinese or Pan Asian food I’m always more inclined to choose lots of smaller dishes over one big one; variety is the spice of life and all that. 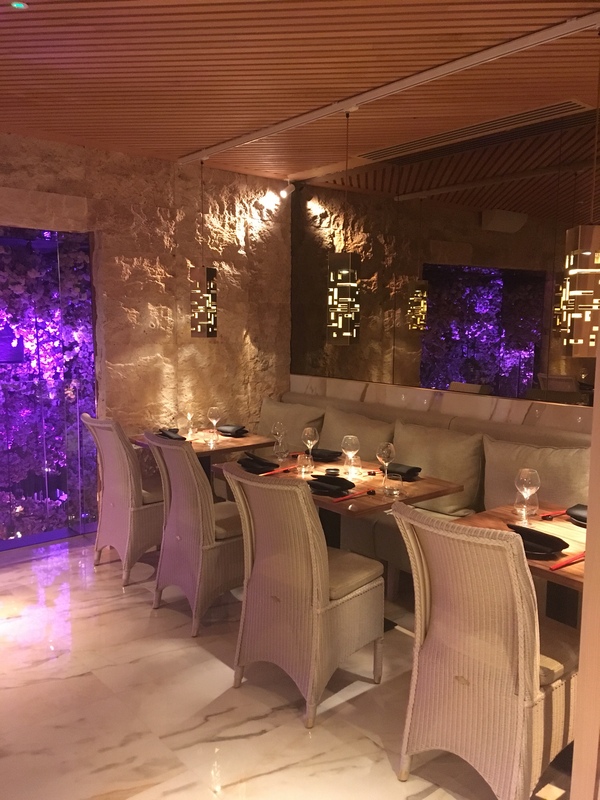 Luckily, in this case, we had plenty of options, from steamed and fried dumplings to tapas style plates of meat, seafood and vegetables – most come in between £7-£10. 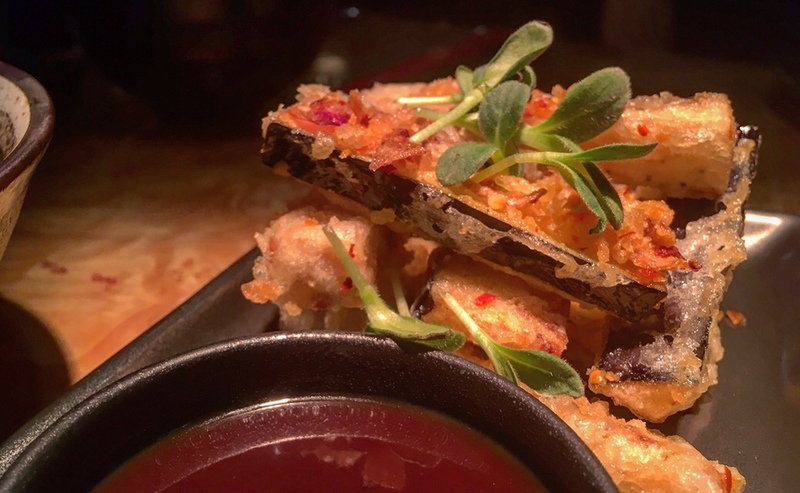 Dim sum seemed a good place to start, with Spicy Iberico Pork Wonton flavoured with Szechuan and peanut. The bright red dumplings contained a mildly spiced ground pork, with the nutty chilli sauce below bringing a pleasant (I’d probably have liked more really) punch of heat. 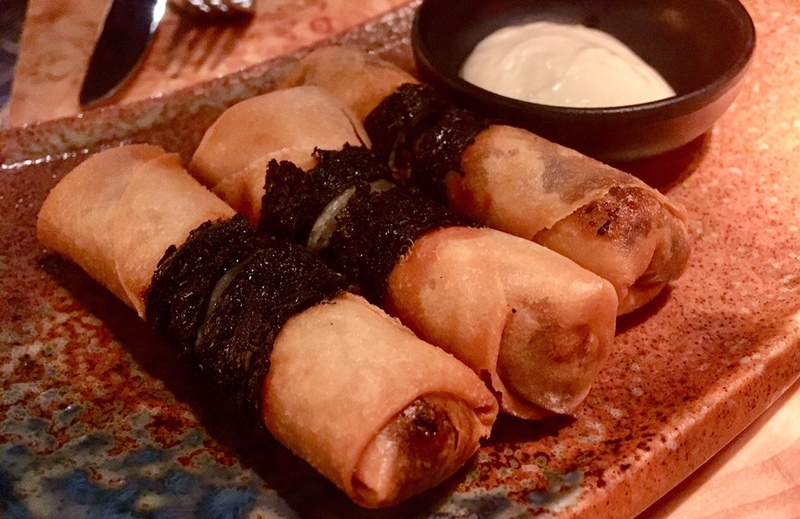 The Wild Mushroom Spring Rolls were crisp, packed with an earthy mushroom mix – the truffle sour cream dipping sauce sets this off perfectly. 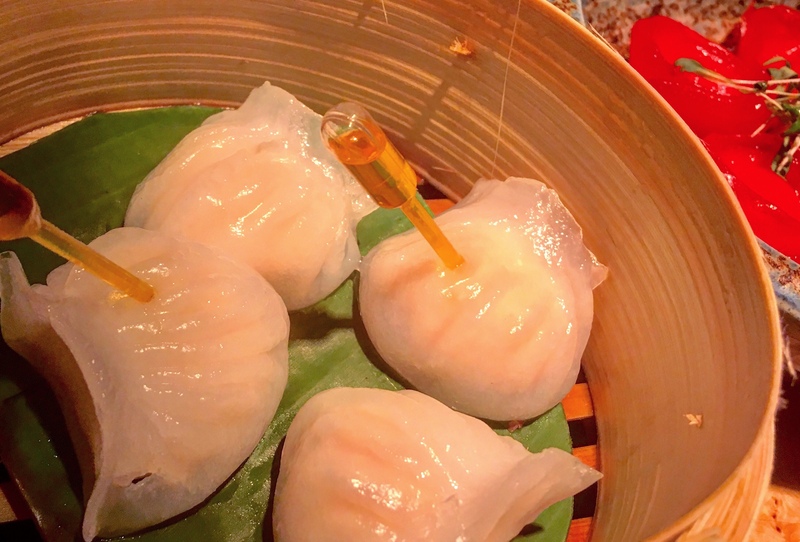 Finally the minced prawn Har Gau XO were delicately flavoured with sesame and XO. I like that you get 4 instead of the usual 3 dim sum, making them easier to share, and the additional sauces (in particular the green jalapeño dip) are a pleasant extra. 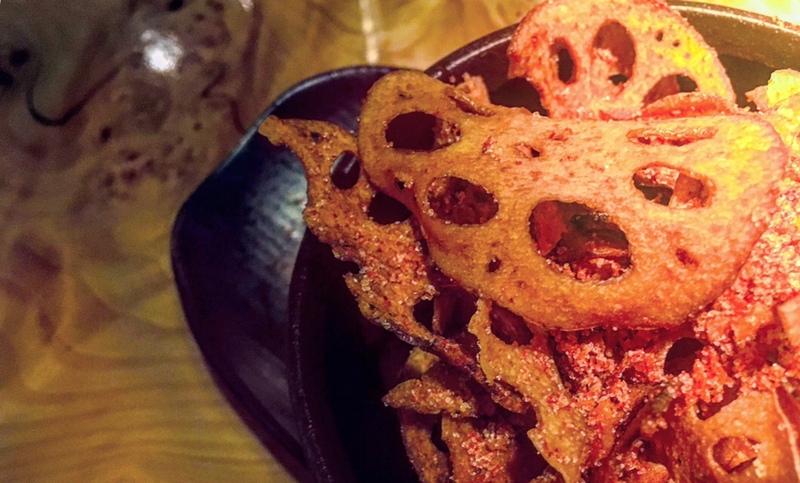 A snack of savoury Lotus Crisps only cost a few quid and kept us going between courses. 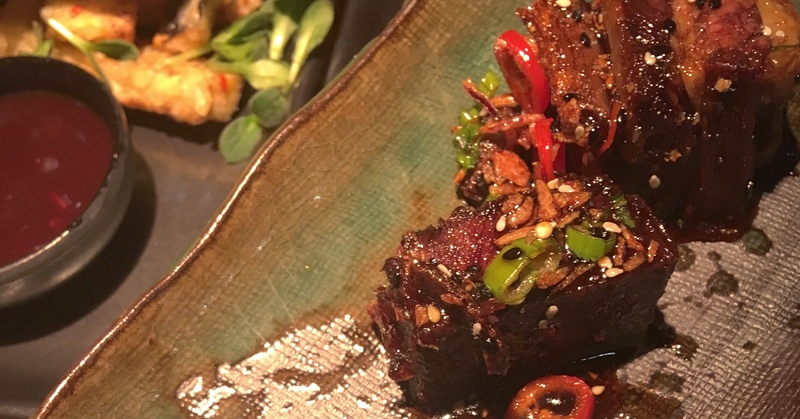 Alongside some side dishes of Beansprout Noodles and Fried Rice (both nice but a bit salty) we shared Beef Short Ribs, rich in soy sauce and topped with crispy shallots and fresh red chilli. Unfortunately, we had a bit of bad luck with this, as two of the four pieces were pure fat. However, the chunks that were as hoped had lovely bite and flavour, and the glaze was rich and sweet. 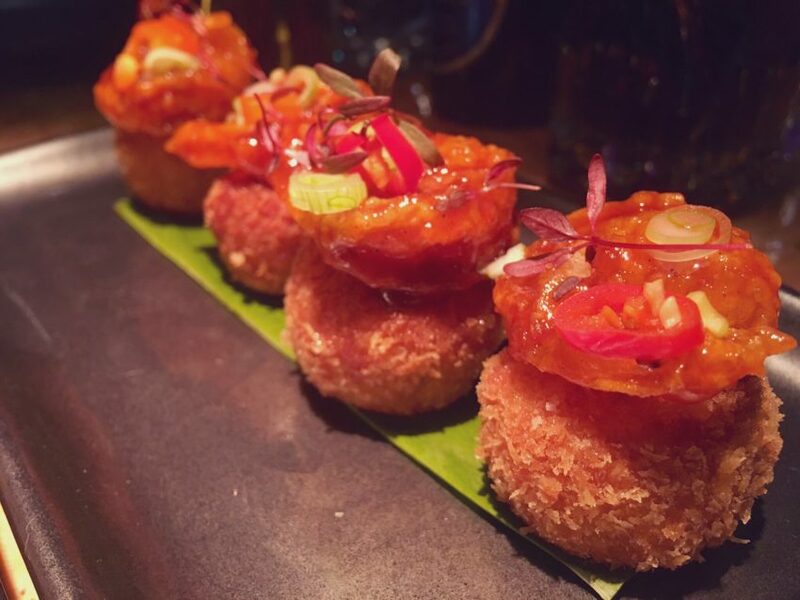 Our Sticky Red Prawns were the clear favourite from our selection, with plenty of chilli and a lovely texture thanks to the mini rice cake below. Salt and Pepper Aubergine lacked the hum of chilli and garlic we expected, instead just tasting quite oily due to the greasy batter covering the lengths of the vegetable. 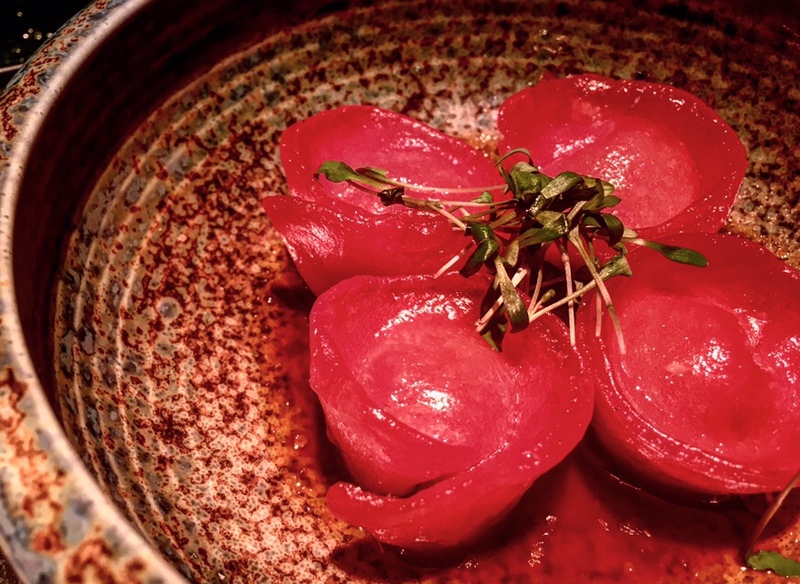 The cherry hoisin dipping sauce is also incredibly pungent – and not necessarily in an enjoyable way. 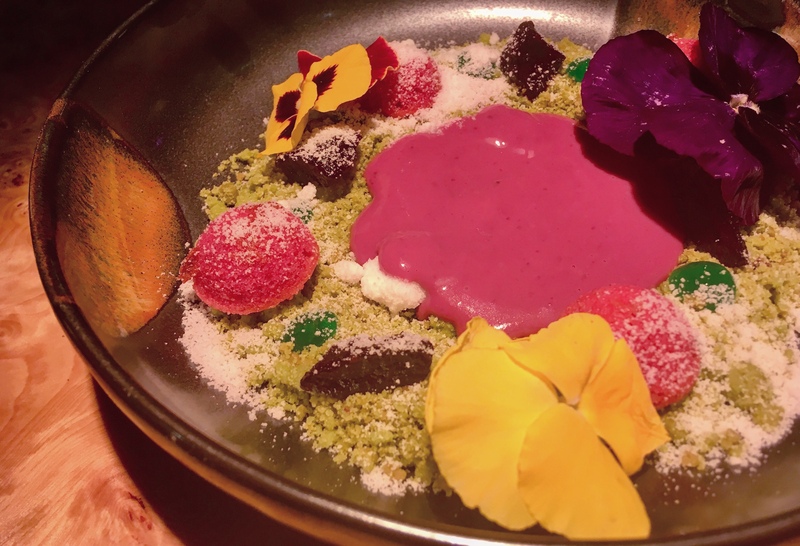 Desserts were limited due to availability during our visit, but I enjoyed my panic choice of Asian Pear Crumble, strewn with chunks of tart fruit, almond and matcha crumb and a (neon) pink custard. Ali’s White Chocolate Igloos were frozen to the point they were actually quite hard to attack with a spoon, but the creamy flavour worked with the blood orange sorbet. 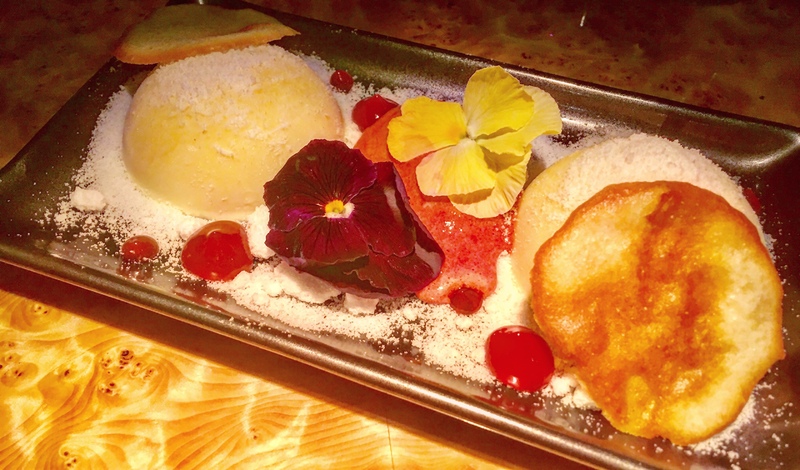 This was served alongside homemade vanilla biscuits and a coconut dusting known at Tattu as ‘snow’. Both were generous in size. I feel like they’ve definitely got a type of guest in mind at Tattu, I’m just not sure it’s me. There’s no denying the restaurant is strikingly beautiful and there’s a decent cocktail menu to be enjoyed, either when dining below ground or in the separate bar upstairs. The decor and attention to detail with the cute extra touches (chilli sauce in a pipette anyone?) does make it feel like a ‘special’ experience, I guess. Is the food life changing? Not for me. Is it enjoyable? In parts. Be aware the mains are quite pricey so it may be worth checking out the menu online first to gauge whether you want to splash out a bit. The service was overly attentive to the point of being a bit suffocating (our neighbouring table commented similar) but I’m sure that will relax as the team settle in. It was well meant but became distracting rather than enhancing the experience. As I said before, we dined during the soft launch period, allowing such things to be assessed and changed where needed. It’s always a bit tricky to rate a place for that reason, so maybe I’ll return a few months down the line to give it another go – I won’t be in a rush though. 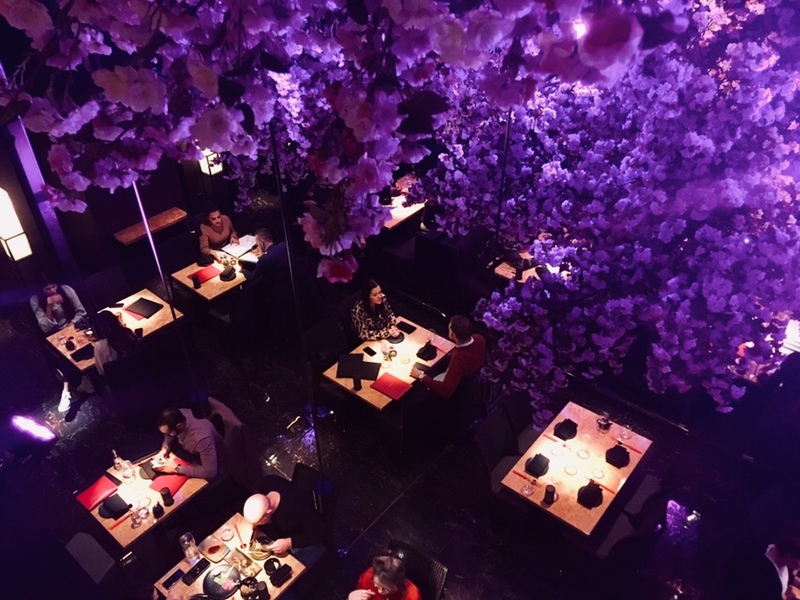 Disclosure: Like everyone who dined during the soft launch period I paid a reduced rate – it was available to all diners at that time who had pre-booked. We paid in full for our drinks. Words and photos are mine. I gave the same feedback on food/service on the night too.